Christchurch, New Zealand – Thousands of New Zealanders have attended a mass vigil in Christchurch to mourn the 50 Muslims killed in an attack on two mosques. 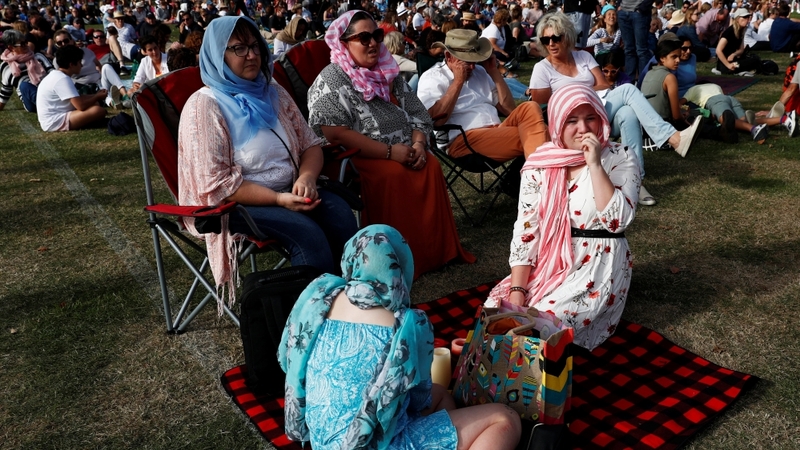 Nearly 40,000 people filled Christchurch’s Hagley Park on Saturday evening, according to local officials, almost 10 days after a suspected white supremacist attacked the Al Noor and Linwood mosques. The March 15 massacre marked the worst mass shooting in New Zealand’s recent history and was branded a “terrorist attack” by Prime Minister Jacinda Ardern. Saturday’s ceremony was the latest in a series of remembrance events and included speeches, singing and moments of silence. Members of the Muslim and indigenous Maori communities were among the participants. Linwood mosque’s imam, Alabi Lateef Zirullah, began the event with an Islamic prayer. The names of the 50 worshippers killed were then read out, beginning with the youngest – three-year-old Mucaad Ibrahim. “These people came here as refugees and migrants,” a Maori speaker said. “May your spirits go to the top of Aoraki … and look down on us and give us peace and love,” he said, using the traditional Maori name for Mount Cook, New Zealand’s highest peak. More than 40 victims have been buried in Christchurch’s New Park Cemetery. Mustafa Boztas, a 21-year-old survivor of the shooting at Al Noor, said remembrance events show that “New Zealand cares” about its Muslim minority, which accounts for over one percent of the country’s nearly five million people. Earlier on Saturday, more than 1,000 people marched in a rally against racism in Auckland, New Zealand’s biggest city, carrying “migrant lives matter” and “refugees welcome here” placards. Before Friday’s ceremony, a nationwide two-minute silence was held. The call to prayer was broadcast on national television and radio stations. A four-year-old girl is being treated in Auckland. Her condition has been described as “critical but stable” by local media. “The shock for him is wearing off and now he is just very quiet, he’s trying to process it and that is going to take a long time,” said Joy, one of several women who wore a headscarf in solidarity. New Zealand needed greater education about Islam, she said as she called on people to address “everyday racism” against minorities. Sam Brosnahan, president of the New Zealand-based University of Canterbury’s student association, said New Zealanders needed to use the current wave of compassion and adopt long-term responses to end racism. “The world has watched in wonder at how we have all responded,” he said. “But the world is also watching what we do next, so let’s show them the Aotearoa the world needs,” he added, using the Maori name for New Zealand. “The service will be a chance to once again show that New Zealanders are compassionate, inclusive and diverse, and that we will protect those values,” she said in a statement. Al Noor mosque imam Gamal Fouda, who survived the March 15 attack, told attendees at Friday’s ceremony in Christchurch that “Islamophobia kills” and the mosque shootings had not “come overnight”. “It [the attack] was the result of the anti-Islamic and anti-Muslim rhetoric of some political leaders, media agencies and others,” Fouda said. “Last week’s event is proof and evidence to the entire world that terrorism has no colour, has no race, and has no religion,” he added. He is expected to face more charges of murder during next month’s hearing, in which he is set to represent himself.